Everyone has his baseball dream when growing up, but few get the opportunity to realize that one special moment. Through 1950, the New York Giants’ affiliate in the Triple-A International League played in Jersey City and Kucks grew up rooting for both the Jersey City Giants and the New York Giants. He played sandlot ball for the Cloverdale A.C. Kucks was first recruited by the Phillies, but after they withdrew a bonus offer to him, he signed with scouts Paul Krichell and Frank O’Rourke of the Yankees for a reported $13,000 on January 1, 1952. (Some accounts have the figure at $18,000.) With the Norfolk Tars of the Class B Piedmont League, Kucks won 15 of his first 17 decisions, including 11 in a row, and finished 20-6 with a 2.55 ERA. He had four shutouts, led the league’s pitchers with 60 assists, and paced his team with 118 strikeouts. as the Tars finished in first place. In the playoffs he posted another win, beating Richmond 5-3, but the Tars lost the series in five games. At the end of the season, Kucks was named to the league’s All-Star team. While this may have been a bit overstating the case (Score went on to win the Rookie of the Year award in 1955), Kucks did effectively jump directly from Class B to the major leagues with a sensational spring. When he joined the Yankees, his roommate was Bob Grim, who had, like Kucks, flourished in the Yankees’ instructional school, making the squad in 1954. On April 23, 1955, at Yankee Stadium in New York, Kucks made his first major-league start. Facing the Boston Red Sox, he pitched into the sixth inning before being relieved by Tom Morgan. The Yankees had staked Kucks to a 3-0 lead and he was credited with the win as the Yankees pulled away for a 7-2 victory. After failing to go the distance in his first two starts, Kucks gained his first complete-game win on May 21, defeating Baltimore 9-4 at Yankee Stadium. On June 1 he limited Kansas City to two hits in eight innings before being removed for a pinch hitter, as the Yankees defeated the A’s 3-1 for Kucks’ fourth win of the season, against one loss. However, Kucks was erratic in his next ten appearances, and he took a 6-4 record into his start at Kansas City on July 24. For eight innings, he and the A’s Arnie Portocarrero matched each other pitch for pitch, and the game was scoreless. A double by Mickey Mantle and a homer by Yogi Berra gave the Yanks the lead in the top of the ninth inning, and Kucks shut down the A’s in their half of the inning to gain his first major-league shutout. In the World Series Kucks pitched in relief in the third and fourth games (each lost by the Yankees) and was not involved in either decision. He remembered many years later giving up a home run to Duke Snider in Game Four.8 Kucks had entered the game in the bottom of the fifth inning with none out and the Dodgers’ Jim Gilliam at second base. The Dodgers had a 4-3 lead. A single by Pee Wee Reese and Snider’s three-run-homer gave Brooklyn a 7-3 lead and the Dodgers went on to win the game, 8-5, and even the Series at two games apiece. The Dodgers won the Series in seven games. In his rookie season, Kucks pitched in 29 games, 13 as a starter, and compiled an 8-7 record with a 3.41 ERA. In high school, he had met Barbara Daum, a cheerleader, and they were married on October 6, 1955. Shortly after the wedding the couple joined the Yankees as they visited Japan. The honeymoon began in Honolulu en route to stops in Japan, Okinawa, and Guam, and continued for more than 50 years until Barbara died after a long illness in 2006. They had two daughters, Laura-Jean and Rebecca, and four grandchildren, Kierstin, Kelly, Katie, and Jessica. Kucks did find some time to pitch during the trip to Japan and posted a 3-0 record with a 0.33 ERA in his three games.9 He also found time to work on a slider. In 1956 Kucks surprised everyone. In spring training, he was not expected to be a part of the rotation, but after Tommy Byrne became ill, Kucks became the number two starter behind Whitey Ford and kept the Yankees out in front as they broke open the pennant race and won by nine games over Cleveland. He was at his best against the teams contending with the Yankees, defeating Cleveland four of the first five times he faced the Tribe. His 18-9 record placed him second on the team in victories, behind Ford. He pitched 12 complete games and had three shutouts. Stengel selected Kucks for the American League All-Star team, but he did not appear in the game. By the end of May, Kucks had won six of his first eight decisions with four complete games, and the Yankees led the league by 6½ games. On June 10 he shut out Cleveland and his two wins against the Tribe that month were key to the Yankees’ maintaining a two-game lead over the Indians as the season entered July. It appeared a certainty that Kucks would win 20 games (he had 18 victories on September 3), but he developed a sore elbow and lost his last two decisions. The injury cost him his place in the starting rotation,11 in during the first two games of the World Series, he pitched in relief. Over the next four games, he was a spectator as Ford, Sturdivant, Larsen (the perfect game), and Turley (losing 1-0) pitched complete games. When Game Seven came around, Kucks ended the season with his own complete game as the Yankees won, 9-0. It was, said Kucks, “my career season.”12 His side-arm sinker was so effective that 16 of the Dodgers’ outs, including the first eight, came on groundballs. Kucks also kept the Dodgers off-stride with his slider, a pitch that he had not used in September because it aggravated the pain in his elbow. There was a tense moment in the bottom of the first inning. Pee Wee Reese walked and Duke Snider singled, and the Dodgers had runners on first and second with one out. Kucks remembered, “I turned to get the rosin bag and I see (Whitey) Ford and Tom Sturdivant warming up in the bullpen. I thought, ‘They really have a lot of faith in the big guy.’”13 He got Jackie Robinson to ground into a double play, and from then on it was clear sailing. The game ended when Jackie Robinson swung at a third strike in his last major-league at-bat. It was Kucks’s only strikeout of the game. Kucks gained notice the following season – for being in the wrong place at the wrong time. On the evening of May 15, 1957, he and his wife were part of a group of Yankees couples including Yogi Berra, Whitey Ford, Mickey Mantle, Hank Bauer, and their wives, that was celebrating Billy Martin’s 29th birthday. After dinner at Danny’s Hideaway, the group went club-hopping, and arrived at the Copacabana sometime after midnight. Accounts of what happened that evening are such that the facts did not get in the way of a good story. During Sammy Davis, Jr.’s act, an altercation broke out between the Yankees and a group of bowlers seated at an adjoining table. In the aftermath, Bauer was accused of punching one of the bowlers, but the charges were eventually dropped. The Yankees players maintained that a bouncer had knocked out the bowler. Berra, Bauer, Mantle, Ford, and Martin were fined $1,000 each by the Yankees while Kucks, because he was earning far less than the established veterans, and, to quote the ever quotable Yogi, “done nuthin’ to nobody,” was docked $500.16 Subsequently, the fines were rescinded by Yankees owner Dan Topping. Kucks was never able to come close to duplicating his 1956 form. In 1957 he went 8-10 and in 1958 was 8-8 with four saves in 34 games, including 15 starts. The highlight of the latter season came on June 3 when he shut out Chicago, 13-0, allowing only two hits, to put his record at 4-1. In that year’s World Series, won by the Yankees in seven games over the Milwaukee Braves, he appeared twice in relief, but was not involved in any decisions. In May 1959, the Yankees sent Kucks, pitcher Tom Sturdivant, and infielder Jerry Lumpe to Kansas City for third baseman Hector Lopez and pitcher Ralph Terry. In his time with the Yankees, Kucks had gone 42-35 with six saves and an ERA of 3.82. 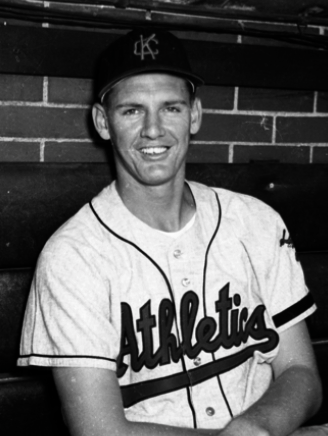 Kucks remained with the A’s through 1960, posting a combined 12-21 record. The highlight of his first season was a 2-1 win over the Yankees on August 1 in which he scattered seven hits. But in 1960 Kucks’s sinker failed him as he yielded 22 homers in 114 innings. He did not win his first game of the season until June 12, when he won in relief. On July 26, manager Bob Elliot gave him an opportunity to start and he had his best outing of the season, pitching a complete game, as the A’s defeated Baltimore 2-1. He remained in the rotation but did not fare well, winning only one of his remaining 11 starts and finishing the season at 4-10 with an ERA of 6.00. In his last appearance in the major leagues, on September 25, 1960, he lasted only four innings and was not involved in the decision as the A’s lost to the Tigers. For his major-league career, Kucks was 54-56 with a 4.10 ERA. After the season Kucks was optioned to Rochester in the International League, where he posted a 10-14 record in 1961. At the end of that season, he was sold to the Baltimore Orioles and shortly thereafter was traded to the Cardinals. He spent 1962 with the top Cardinals farm team, the Atlanta Crackers, where he posted a 14-7 record during the regular season and won three games and lost two in the playoffs. In the Junior World Series opener he defeated Louisville, 5-1, allowing only four hits, but was out-dueled, 2-1, in the fifth game of the series. Atlanta won the Junior Series in seven games, and over his last 27 innings in the playoffs, Kucks allowed only two earned runs. .
Kucks won the opener of the first round of the International League playoffs, defeating the Toronto Maple Leafs 9-1. Atlanta swept Toronto in four games and moved on to meet Indianapolis for the league championship. Kucks lost twice as Indianapolis won the series in five games. In what was to be his final professional appearance, he pitched the final inning of the last game of the series and was not involved in the decision. The Cardinals switched their Triple-A affiliation from Atlanta to Jacksonville in 1964, and Kucks went to spring training with the Jacksonville Suns. But that spring he tore a nerve in his arm, and did not return to the mound. He accepted a position as a roving pitching instructor and scout in the Cardinals organization for the 1964 season. In retirement, Kucks lived in Hillsdale, New Jersey. While still playing, he had begun training in the brokerage business and took correspondence courses with the New York School of Finance during his days in Kansas City. In 1964, after leaving the Cardinals organization, he earned his broker’s license, went to work for Golkin, Bomback and Company, and stayed with them through 1973, working out of the firm’s Jersey City office.19 For 20 years afterward, he was an account executive for several steamship companies.20 He also managed the Jersey City team in the Atlantic Collegiate Baseball League from 1967 through 1970. In 1992. Kucks was inducted into the Hudson County (New Jersey) Hall of Fame. In his later years, he also provided care for his wife, Barbara, who died in 2006. Kucks died of cancer on October 31, 2013. Barra, Allen, Yogi Berra: Eternal Yankee (New York, W.W. Norton, 2009). Daniel, Dan, “Howard, Kucks, Sturdivant Pick of Yank Rookie Crop,” The Sporting News, April 13, 1955, 11. Daniel, Dan, “Ol’ Casey Chuckles Over the Guys who ‘Pitied My Pitching,’ ” The Sporting News, June 8, 1955, 7. Daniel, Dan, “Pat-on-the-Back Strategy Paid Off for Case on Kucks,” The Sporting News, May 16, 1956, 7. Daniel, Dan, “Hats Off,” The Sporting News, September 12, 1956, 21. Daniel, Dan, “Glamour Went to Larsen but Kucks Took ‘Big One,’ ” The Sporting News, October 17, 1956, 11. Eck, Frank, “Yankees’ Kucks Is Rookie With Poise,” Aberdeen (South Dakota) Daily News, April 7, 1955, 14. Levin, Jay, “Johnny Kucks, Yankees 1956 World Series Hero and Hillsdale Resident, Dies at 81,” The Record (Hackensack, New Jersey), November 2, 2013. Madden, Bill, “Johnny Kucks, World Series Hero for the Yankees in 1956, Dead at 80,” New York Daily News, November 1, 2013. Noble, Marty, “Showing Appreciation for 1956 Series Hero Kucks,” MLB.com, November 3, 2013. Rolfe, Shelley, “Yanks’ Cheap Bonus Baby Gives Tars Top Pitching,” Richmond (Virginia) Times-Dispatch, July 3, 1952, 27. Rosenthal, Harold, “Phils Cooled on Kucks as Kid Prospect,” The Sporting News, October 31, 1956, 5. Weber, Bruce, “Johnny Kucks, Who Pitched Yankees to Title, Dies at 81,” New York Times, November 1, 2013. 1 Allen Barra, Yogi Berra: Eternal Yankee (New York, W.W. Norton, 2009), 227. 2 Associated Press, “Memories: Last Subway Series Was One to Remember.” Erie (Pennsylvania) Times-News, October 19, 2000. 3 Marty Noble, “Showing Appreciation for 1956 Series Hero Kucks,” MLB.com, November 3, 2013. 4 Dan Daniel, The Sporting News, May 16, 1956, 7. 5 Dan Daniel, The Sporting News, April 13, 1955, 11. 7 Dan Daniel, The Sporting News, June 8, 1955, 7. 8 Thomas Harris interview with Johnny Kucks. 9 New York Times, January 30, 1956, 32. 10 Joseph M. Sheehan, “Kucks of Bombers Takes 17th, 2-0,” New York Times, August 25, 1956, 8. 11 Harold Rosenthal, The Sporting News, October 31, 1956, 5. 12 Bill Madden, “Johnny Kucks, World Series Hero for the Yankees in 1956, Dead at 80,” New York Daily News, November 1, 2013. 13 Associated Press, “Memories: Last Subway Series Was One to Remember,” Erie (Pennsylvania) Times-News, October 19, 2000. 14 Bruce Weber, “Johnny Kucks, Who Pitched Yankees to Title, Dies at 81,” New York Times, November 1, 2013. 15 New York Times, October 18, 1956, 43. 17 Leonard Koppett, New York Times, September 15, 1964, 42. 18 The Sporting News. August 10, 1963, 38. 19 New York Herald Tribune, September 22, 1964. 20 Joe Chessari, “Where’s What’s-His-Name,” The Record (Hackensack, New Jersey), March 31, 1990.